The boulder-lined canyons and dense alpine forests that make up much of Utah’s terrain also make for spectacular single-track trails. Mountain biking fans will find that RV camping is the best way to get close to Utah’s top trails. Ride along as we offer tips for enjoying four of the best mountain biking venues in Utah, including where to camp closest to the trailheads. Deer Valley Ski Resort in Park City is becoming famous with single track fans for its challenging downhill trails served by three convenient chair lifts. Set up your base camp at nearby Uinta-Wasatch-Cache National Forest campgrounds or at one of several private RV campgrounds in Heber City or Park City. What can you expect to experience on Deer Valley’s trails? How about six mountains, more than sixty miles of mountain bike trails and easy access to hundreds of miles of additional trails in Park City’s trail system? While at the resort, take the chairlift to the top of your chosen mountain and then blast down trails built by experts for each level of mountain biking skill. Slickrock Trail, just outside Moab, UT is a breathtaking, gear-grinding ride over Navajo sandstone that’s best suited for experienced technical riders, but there’s a loop that even newbies will want to try. Moab has become a magnet for mountain bikers from around the globe, thanks to its proximity to trails through awesome terrain like Flat Iron Mesa, Klondike Bluffs and Arches National Park. Adding to the appeal is the abundance of camping venues in the Moab area. Whether you enjoy a full-amenities RV resort, BLM ‘dispersed’ camping or something in between, there’s a place for you to park the RV while mountain biking in Moab. Bonus Tip: outfitters abound in Moab, offering bike rentals, shuttles to popular trails and guided trips through area terrain. Wasatch Crest Trail on Salt Lake City’s eastern border offers plenty of trail riding thrills, plus views from the crest at nearly ten thousand feet elevation. It’s easy to access this trail without finding a place to park at the trailhead, thanks to local mountain bike shuttles that make several trips a day to the summit. Ride up, bike down and unwind in the comfort of your RV. Camp at East Canyon State Park, Antelope Island State Park or at one of the many Salt Lake City area RV resorts, depending on your camping style. Brian Head Ski Resort, smack in the middle of a golden triangle of jaw-dropping geography, offers one hundred miles of trails down Giant Head and Navajo Mountains. Centrally located near Cedar Breaks National Monument and Bryce Canyon and Zion National Parks, you’ll never run out of challenging terrain while you’re there. Plan to experience all the elements of single track challenge and trails suited to every level rider. Buy a mountain biking day pass to gain access to chair lifts, shuttles and all Brian Head trails. Where to camp while biking Brian Head? Try one of five private RV parks in Cedar City or the Cedar Canyon Campground in Dixie National Forest. You’re sure to find Southern Utah’s famous hospitality and there’s no end to spectacular scenery here! Ready to load the mountain bikes and head for Utah? 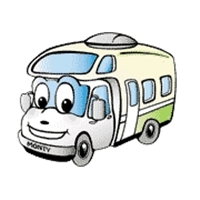 Before you go, reserve your campsites and, if you don’t own an RV, make arrangements for a Salt Lake City RV rental. Mountain biking and RV camping in Utah—there’s no better way to get the adrenaline flowing.